Note: The menu versions turn the object snaps on for one pick only. For persistent object snaps, use the Osnap control. The object snaps constrain the marker to an exact location on an object such as the end of a line or the center of a circle. When Rhino asks you to choose a point, you can constrain the marker to specific parts of existing objects by turning on object snap modes. When an object snap is active, moving the cursor near a specified point on an object causes the marker to jump to that point. Object snaps can persist from pick to pick, or can be activated for one pick only. Multiple persistent object snaps can be set in the Osnap control. 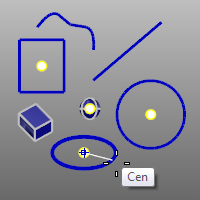 All object snaps behave similarly, but snap to different parts of existing geometry. For example, the End object snap finds the endpoint of a curve. When activated, the end object snap constrains the marker to the endpoint of the curve closest the cursor. More than one object snap can be active at the same time. As the cursor passes over an object, the appropriate object snap displays. Use persistent objects snaps to maintain an object snap through choosing several points without having to reactivate the object snap. Only Cen, End, Int, Knot, Mid, Near, Perp, Point, Quad, Tan, and Vertex object snaps can persist. You can set the Snap radius for object snaps. This means how close you have to move the cursor to the point before the marker jumps to the point. 1. On the status bar, click Osnap. 2. Select or clear the desired object snap check boxes. Note: Disabling the object snaps suspends their use temporarily. When the Disable check box is cleared, all previously set object snaps turn back on. 2. Press Alt to temporarily suspend object snaps. Note: If object snaps are disabled, press Alt to toggle them on temporarily. One-shot object snaps only work when Rhino is requesting a point, are turned on for one pick only, and override all persistent object snaps for that pick. Press Shift and click an object snap check box. For example, if End, Near, and Point persistent object snaps are set in the Osnap control, and you set the Mid object snap for one pick, End, Near, and Point will not work for that pick. After the pick, the persistent object snaps will reactivate. When object snaps are on, click and hold near object snap locations to use them for the start or end locations of the drag. To suspend object snaps for the drag, press and hold Alt. Drag line from midpoint to circle center. The Project button on the Osnap control projects any object snap to the current construction plane. 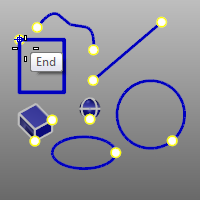 For example, in the illustration, the curve projects to the construction plane from snapped locations on an object. Simple object snaps snap to one location on an object. Move the cursor near the target object. When the marker jumps to the snap location, click the left mouse button. If a command is active, NoSnap turns off persistent object snaps for one pick. 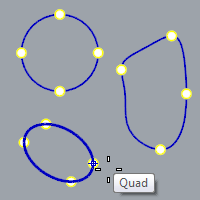 Snap to the center of a circle, arc, closed polyline, centers of single surfaces with a polyline outer boundary and no holes, and annotation text bounding box. Examples of Center object snap. Snap to the end of a curve, text corners, interior vertices of polylines and joined curves, the seam point on closed curves, and the "corners" of surfaces, and polysurfaces. Examples of End object snap. Snap to the intersections of curves, edges, and isoparametric curves on a surface. 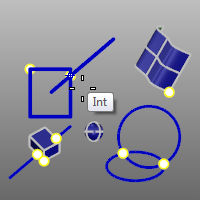 Examples of Intersection object snap. 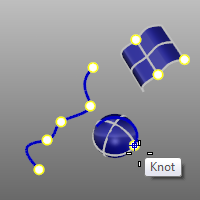 Snap to a knot on a curve or surface. Examples of Knot object snap. Snap to the midpoint of a curve, surface edge, or a segment of a polycurve. Examples of Midpoint object snap. 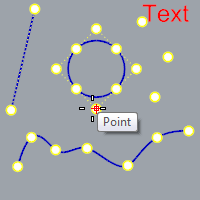 Snap onto a curve or surface edge at the cursor location. Example of the Near object snap. Snap perpendicular to a curve or surface edge. Examples of the Perp object snap. Note: The Perpendicular object snap is not effective for the first point for a command. Also snaps to centers and corners of rectangular lights and block insertion points even if control points are not displayed. Snap to the point on a curve that is at the maximum x or y point relative to the current construction plane. ● The quadrant points of circles and arcs are at the extremes in each construction plane axis direction. ● Ellipses have quadrant points at the ends of the ellipse axes if the ellipse is oblique in addition to those at the construction plane extremes. 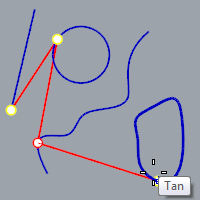 Snap tangent to a curve. Examples of Tangent object snap. Note: The Tan object snap is not effective for the first point for a command. 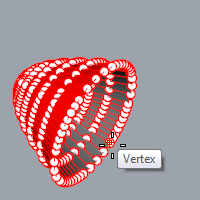 Snap to a mesh vertex. 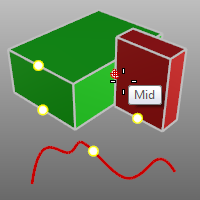 ● Use the CullControlPolygon to disable snapping to vertices on the back side of mesh objects. ● Mesh control points do not have to be turned on when using the Vertex snap. The location where the edges of the mesh faces meet. The mesh vertex (plural vertices) contains x-, y-, and z-coordinates and may contain a vector normal, a color value, and texture coordinates. Note: When picking points during these steps, use simple snaps (End, Near, Point, Midpoint, Center, Intersection, and Quadrant) for greater precision. Press the Ctrl key and hover over the Osnap control. The alternate reference object snaps appear. Start a circle located on the line between the center of the circle and the end of a line. 1. Pick the start of the tracking line (the center of the circle). 2. Pick the end of the tracking line (the end of the line). 3. The marker moves only along the tracking line. 4. Click the left mouse button to specify the location. Track along a line parallel to a reference line between two points. Start a line along a line parallel to the rectangle that passes through the circle's center. 1. Pick the start of the base line (the corner of the box). 2. Pick the end of the base line (the other corner of the box). 3. 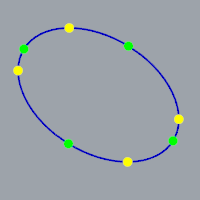 Pick the start point for parallel tracking (the Center of the circle). The marker moves only along the tracking line. 4. Click the left mouse button to specify the location for the start of the line. Snap midway between two specified locations. 1. Pick the first reference point. 2. Pick the second reference point. Snap from a specified base point. ● The From object snap differs from the rest of the object snap because it is used to set the base point for ortho, distance constraint, angle constraint, and relative coordinate entry. ● Ortho constrains the marker to lines radiating from the last pick point. Similarly, distance constraint constrains the marker to a circle of a specified radius from the last pick point. You can set this point, without picking it, with the From object snap. Center a circle four units from the endpoint of a line. 1. Snap the base point to the end of the line. 2. Type 4 and press Enter. 3. The marker is constrained to four units from the endpoint of the line. 4. Click to place the circle's Center point and pick the radius. Track along a line perpendicular to a curve. Draw a line perpendicular from a line at the intersection with the circle. 2. The cursor moves only along the curve. Cross-hairs appear to indicate the perpendicular and tangent lines that extend from any point on the curve. 3. Pick the point on the curve to extend the perpendicular line from. The marker tracks along the perpendicular line. 4. Click the left mouse button to start the line. Track along a line tangent to a curve. Draw a line tangent from the circle at the intersection with the line. The marker moves only along the circle. Cross-hairs indicate the perpendicular and tangent lines that extend from any point on the circle. 2. Pick the point on the circle to extend the tangent line from. The marker tracks along on the tangent line. 3. Click the left mouse button to start the line. Snap to and track along a selected curve for one pick. ● The OnCrv object snap is useful if the model is complex and Near object snap alone does not lock to the object you would like it to. ● The curve parameter displays in the status bar when moving the mouse along the curve. The marker moves only along the selected curve. 2. Click the left mouse button to place the point. Snap to and track along a selected curve until the command completes. Snap to and track over a polysurface for one pick. Place a point object on a polysurface. The marker moves only over the polysurface. 2. Click the left mouse button to place the points. Snap to and track over a polysurface until the command completes. Snap to and track along a selected mesh object for one pick. The marker moves only along the selected mesh. Snap to and track along a selected mesh until the command completes. Snap to and track over a surface for one pick. Place a point object on a surface. The marker moves only over the surface. 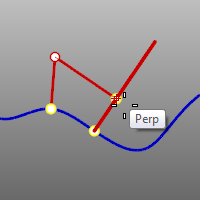 Note: If you are tracking over a polysurface, the marker is restricted to the single selected face. The cursor changes shape to indicate that you cannot pick. To track over the whole polysurface, see the OnPolysrf object snap. Snap to and track over a surface until the command completes. Snap to a curve a percentage from the end. The curve is marked with temporary black points that are automatically snapped to. If the percentage is less than 50, the curve is marked with multiple snap points. For example, when using 30, you get snap points at 30%, 60% and 90%. You can snap to surface isoparametric curves using the Int object snap whenever the input is constrained to a surface, for example in ExtractIsocurve, InsertKnot, OrientOnSrf, and with OnSrf, and OnPolysrf one-shot object snaps. isoparametric curves object snapping is "weaker" than normal object snaps. The normal object snaps are evaluated first, and only if they fail will Rhino try to snap to the isoparametric curve intersections. One-shot object snaps are automatically transparent. In other words, when scripting these, you do not need to use the apostrophe character to make the object snap work while a command is running. The Osnap command sets the status of object snaps from the command line. ● This command is useful for scripting, because it can set any object snap combination from command line. ● You can temporarily suspend the effect of the object snaps with the DisableOsnap command. The ShowOsnap command turns the Osnap control on, off, or toggles the current state. The DisableOsnap command manages the state of persistent object snaps. In the Osnap control, click the Disable button. When Object snaps are disabled, persistent object snaps are temporarily suspended. In the Osnap control, deactivate the Disable button. All persistent object snaps will be reactivated. In the Osnap control, right-click the Disable button. When object snaps are disabled, press Shift to activate them for one pick. Press Ctrl to activate one-shot object snaps when object snaps are disabled. The ProjectOsnap command projects object snaps from the actual snap point to the construction plane. 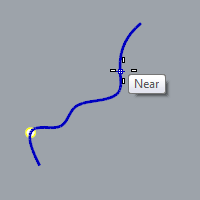 When Osnap projection is on, and the cursor is over an object snap point, the marker projects to the current construction plane with a white tracking line between it and the cursor. If Planar mode is on, the ProjectOsnap command will project the object snap to the "virtual plane" that is set by the planar mode. Note: When projection is on, the prefix "Projected" is added to the tooltip as a reminder. The SnapToLocked command snaps work on locked objects and on objects on locked layers.